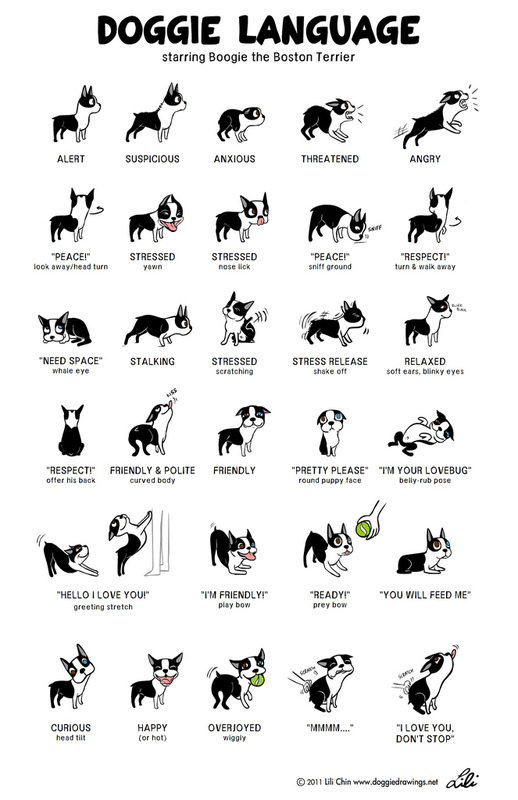 Home / Blog/Training Tips / Body Language – do you know what your dog is telling you? 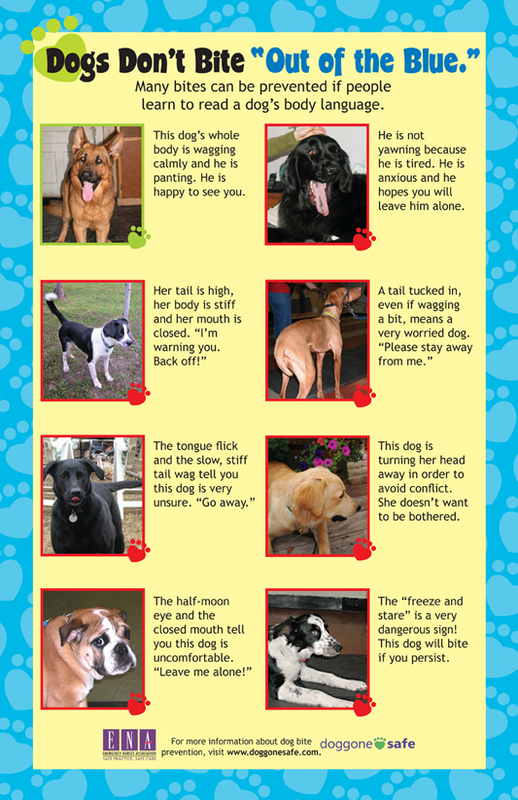 Body Language – do you know what your dog is telling you? Dogs do not speak a verbal language so the only way they can communicate with us is by using their body (and tones, which usually come after the body signals-see below). We need to know how to “listen” to our dogs by learning to read their body language in different situations. I can not tell you how many times I have heard from clients that a dog’s bite “came out of nowhere” when the dog was actually “telling” (probably screaming!) that he was uncomfortable in the situation, but no one was “listening” to him. What exactly does your dog’s body look like when he is at home with you, on walks, with other dogs? What does he look like when he is relaxed and comfortable? Or uncomfortable? Did you know most dogs do not like hugs and kisses? 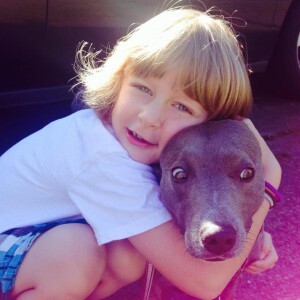 Take a photo of your dog being hugged and see if you notice any of the stress signals below (tongue flicking, yawing, head turning and whale-eye are all commonly seen when a dog is hugged). If you are not sure if your dog wants your pets, go ahead and pet him for a few seconds and then stop. See what he does next – does he lean in for more (you are good – go for it!) or does he walk away (no thank you, he “says”). 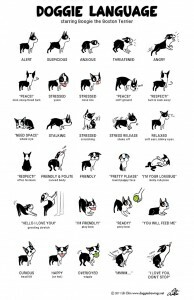 Below are a few of the postures we see in dogs who are not comfortable. 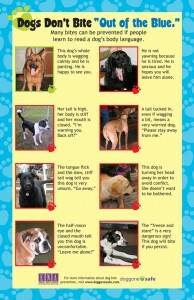 Take note of your own dog’s body language and see if he exhibits any of the ones listed below (or any others). Your dog literally freezes and stands completely still. The fur on the dog’s back (from his neck to the base of his tail) rises. This can be a normal response when a dog encounters new dogs. It is his natural way of saying “look how big I am.” His hackles should go down once he has greeted a dog properly. It’s good practice to remove a dog from play (at least momentarily) if his hackles are up continuously since it tells us his arousal level is raised. There is a difference between a “soft eye” – the loving look your dog gives you while you pet him on the couch, and a “hard eye.” Get to know the difference. Your dog should not be allowed to “hard stare” another dog. You may also see your dog with a “hard face” as opposed to his normal, relaxed “soft face”. Staring of this sort needs to be redirected immediately. A high, wagging tail is not always a sign of “happiness” instead, it is often a sign of a dog in an aroused state. A low, slowly wagging tail or a full hind-end wag (usually horizontal to the floor) is ideal. A tail tucked between his legs is a sign of fear, insecurity or submission. Which way are your dog’s ears going? Are they flat against his head, forward, erect? Can you see one ear going towards a sound or another dog even when your dog is not looking at him? Dogs with erect ears are particularly easy to read. Raising one paw off of the ground is often a sign of uncertainty “what am I supposed to be doing here” or insecurity. “Big dog” posturing, hackles up, moving slowly. Trying to intimidate the other dog. Often putting his head over the other dog’s shoulders. Often seen with posturing. Following another dog around, tailing him. Check out our Pinterest Board on Body Language for many more examples! Growling – (this one is obviously auditory but often comes as the 4th signal after orienting to the subject, freezing and staring). Learn more about body language at our Understanding Canine Body Language Seminar!